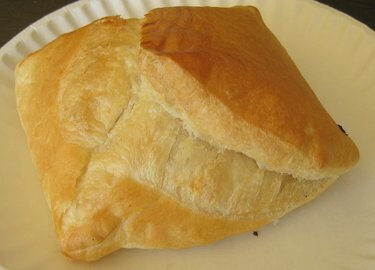 After reading about the Republic of Georgia in the "cooking vacations" portion of the May Gourmet Magazine, I couldn't stop thinking about Argo Georgian Bakery. I posted about my love of Argo over at Gapers Block on Friday and was lucky enough to make a trip up to Devon with Nick this afternoon. I haven't made khachapuri in a long time, but I plan to soon. The Georgian Feast by Darra Goldstein is the best Georgian cookbook available, in my opinion, and provides the recipe that I typically use. However, you could also try Nigella Lawson's recipe that The Traveler's Lunchbox provides (along with some stunning photos) or the recipe published in the aforementioned issue of Gourmet. I turned 26 last Friday. Nick met me after work and we walked from my new job in the Ukrainian Village to the May Street Market in the west loop. Neither of us had been to the May Street Market before and I was really pleased with his choice. The host explained to us that their menu changes frequently because they buy their ingredients from local and sustainable resources (he mentioned the Green City Market by name). 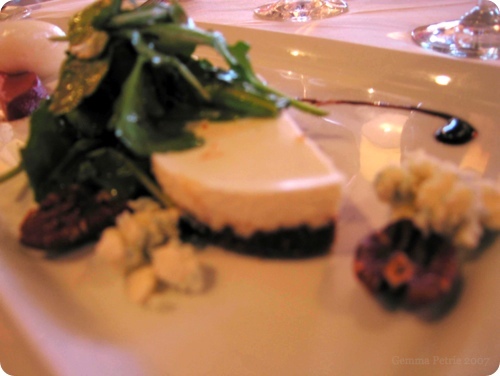 On the top left is the "Maytag blue cheesecake with roasted candied beets, arugula, spiced pecans, and elderflower sorbet." 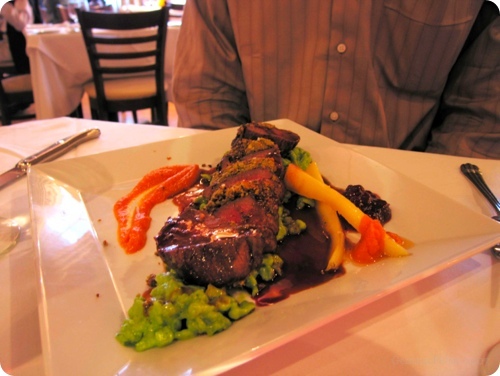 Nick ordered the "roasted venison medallions in a pistachio crust with carrot purée, chive spaetzle, and lingonberry sauce." 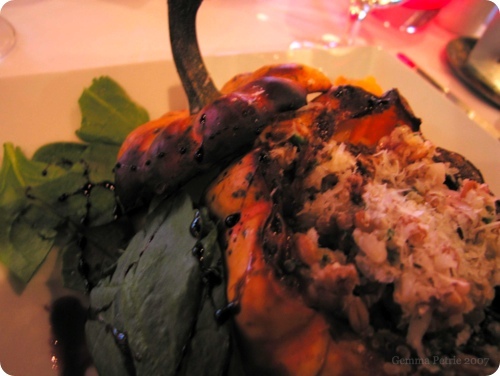 I ordered the pumpkin risotto with quinoa and dried cherries. It was fabulous with a very fitting presentation. For dessert we shared "chocolate-banana bread pudding, caramel ice cream, chocolate sauce, and caramelized banana." Everything was delicious and I highly recommend a visit. Nick also bought us tickets to Bruce Springsteen! The show is in late October and I am very excited to see him for the first time. On Saturday afternoon Nick and I met my parents, my brother and my grandmother at my Uncle Jack and my Uncle Dave’s house in Old Town. 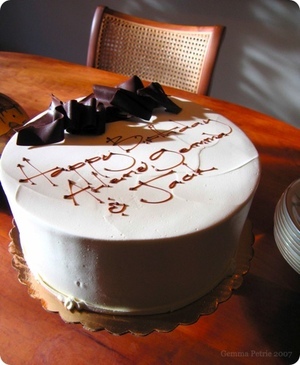 We spent the beautiful, sunny day celebrating three birthdays: mine, Jack’s and my grandmother Arlene’s. Dave is one of the best cooks I know. 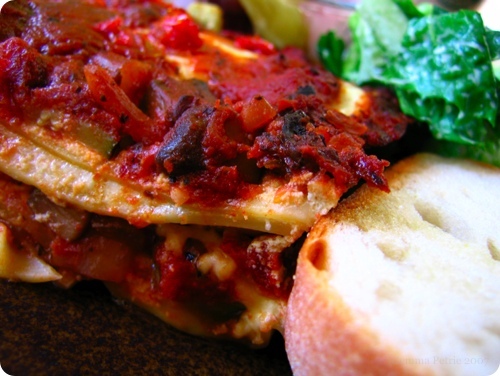 He made us a delicious lunch of vegetarian Portobello lasagna, meat lasagna (sauces from scratch of course), Caesar salad, and garlic bread. My mom brought a pretty fruit and yogurt salad as well. For my birthday my parents gave me a hefty sum to aid in my new computer purchase, which is very exciting! They also gave me a pair of beautiful earrings from one of my favorite jewelers, Studio 2015 in my hometown of Woodstock. Also, my brother bought me gemmapetrie.com! That was sweet and thoughtful. I will do something interesting with it soon. Jack led us on a walking tour of Old Town where we were charmed by quaint old store fronts and left aghast by $40 million dollar concrete homes. When we returned for dessert we saw the stunning carrot cake that Jack and Dave ordered from Bittersweet. It was giant and delicious. Nick and I returned home where I found these beautiful flowers from Eileen. Note the kale, so beautiful. 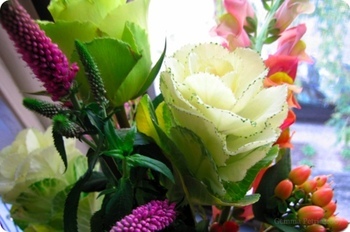 This may have been the prettiest bouquet I have ever seen. It was perfect for a late summer/early fall birthday. We had a quick dinner at Small Bar before my friends arrived. It was great to see so many people that I love all in one place, many of whom I do not see very often. Harold arrived with a kitchen torch and butane for me. We will plan some exciting gastronomic adventure soon to show it off. All in all this was one of my most memorable birthdays yet. Outstanding food, family, friends, good beverages and long walks in Chicago - I don't need much else. Last Saturday Harold and I visited Artopolis Bakery Cafe in Greektown. Set along Halsted amongst noisy Greek restaurants and small grocery stores, this attractive cafe boasts sunlight, space, plenty of seating, and a wide array of foods and drinks. It is no small wonder that the clientele appeared to be largely UIC students. We left with four loaves of bread and two decent cups of coffee and headed to Harold's house. Harold laid out a small bowl of arugula, two fine cheeses that had been coming to temperature, and some seltzer water, then we began with the 'French epis long' that you see above. 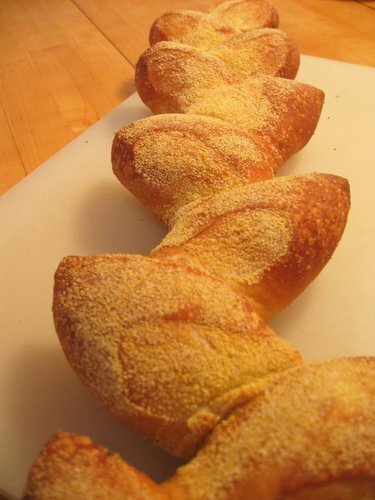 This was a gorgeous looking bread, dusted with cornmeal and expertly split. 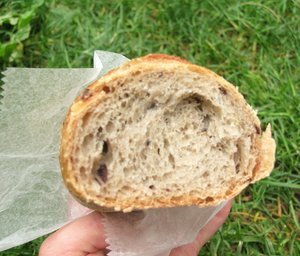 The exterior was nice and crusty and the crumb was soft and chewy-though not resilient. 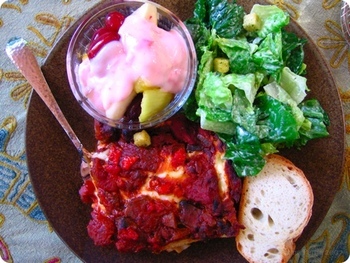 The bread had a nice subtle flavor that went wonderfully with the cheeses. This was not an amazing bread, but certainly quite passable. It was also the first epis cut I have seen since beginning these reviews, so that increased my enjoyment of this bread. 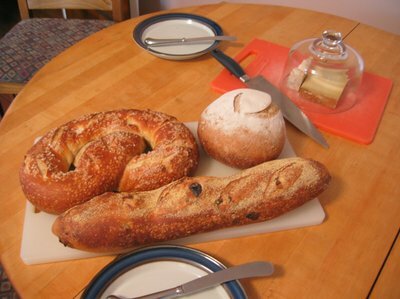 In this photograph you can see the French pretzel, the round levain sour dough, and the kalamata olive bread. In the distance you can see our cheeses (and below you will find a better photograph) The first was a hard raw milk Gruyere-Reserve by Emmi and the second was a softer sheep's milk cheese from Neals Yard Dairy. The French pretzel was available with salt or with sesame, we naturally chose salt. 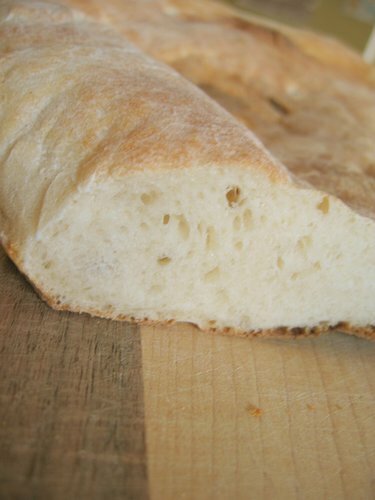 A very thin and chewy crust enclosed a crumb with very small and uniform holes. The crumb was a bit bland and unresilient, though moist and the crust was pleasant, though the salt was doing most of the work, I believe. This was a mediocre bread, the crumb needs some work. I would be interested to try this with the sesame in place of the salt. 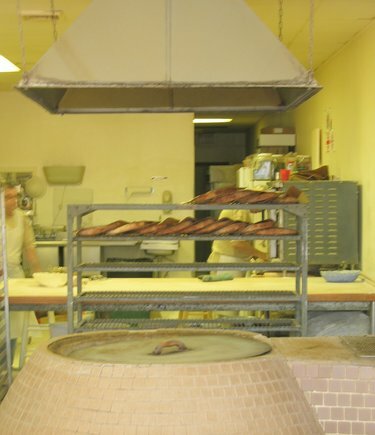 On the left is the French pretzel interior. To our right is the levain sour dough interior. "Levain" is a French word associated with the English "leavened" or meaning "to rise." Basically, this simply means that the bread is naturally leavened, or to put it more simply, a sourdough. One could find a more eloquent description of the nuances of this word. 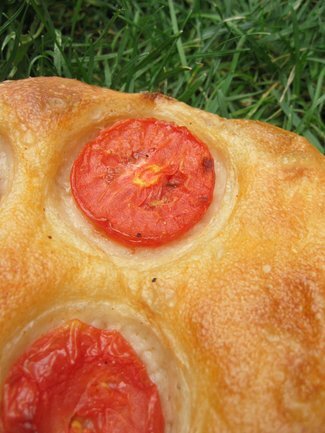 This sour dough round had a beautifully flour dusted top and a thin, light, overly chewy crust. Some whole wheat flour had been used resulting in a very smooth texture and flavor which was quite nutty and earthy. 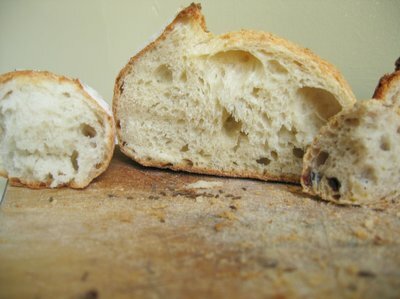 The crumb was soft, moist, and unresilient and the crust should have been more substantial and crisper. The over-all flavors, though nice, would not be described as sour. Amazingly, the bread did not take cheese well at all. This bread was a disappointment due to not being nearly as good as it looked. 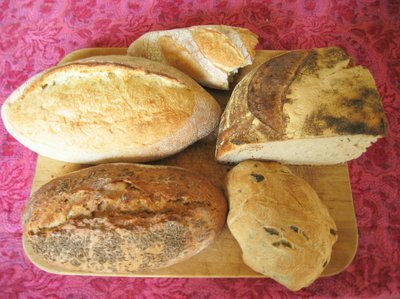 We then moved on to our last loaf, the kalamata olive bread, which you see on the right in the above picture (the French epis long interior is on the left). 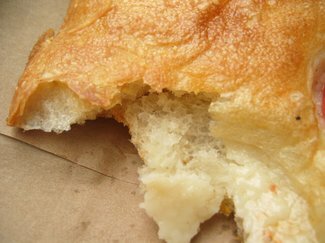 The soft crust was dusted with cornmeal and the crumb was -again- soft, moist, and unresilient. The crumb contained the expected kalamata olives but also. . . chopped onions and flecks of oregano. Why oh why do people insist on including cold and wet ingredients in an otherwise decent bread? 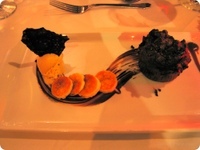 The flavors were strange and resulted in a sweet taste. The onions and the olives did not compliment each other well. Over-all, this tasted like cheap pizza dough or some horrible "fresh baked" creation from Subway. This was a thoroughly uninspiring bread and something to avoid. In conclusion, the Artopolis bakery and cafe looks like a lovely place to spend a quiet afternoon people watching, reading, drinking coffee, and munching on their impressive selection of foods (and I intend to do just that sometime soon) however, their breads are mediocre to poor depending on what is selected. They suffer from the all too common ailment of seemingly mass-produced breads where the crust is thin, dense, and overly chewy and the crumb is soft, far too moist, and completely unresilient. These breads had no character and tasted roughly the same if you were to remove the salts, olives, and whole wheat flours. The French epis long (you can see another interior shot above) and the levain sour dough were the better of the four, but while on the higher end of mediocre, these breads also left something to be desired. My first experience at Fox & Obel was kind of horrible. I went during my lunch break from work one day to poke around and perhaps buy something unique. I'm all for shelling out too much money for something that I have never seen before and that looks like an exciting kitchen addition, however I was disappointed to see that Fox & Obel simply sells mass marketed gourmet mustards that you can find in any foofy coffee shop and your standard imported British cookies---at about twice the price. I'm sure if I spent more time in there I could find something intriguing and there is something to be said for having all of those items in one store, but I was still over-all unimpressed. On this first day I tried their bread, a baguette, and the female employee helping me was impossibly rude and the baguette was impossibly rock-hard. I wouldn't have gone back so soon except that Rob at Vital Information convinced me to give them a second chance. Harold and I drove up last Sunday and spent a large amount of time looking for parking. Reader be savvy: Fox & Obel will validate your parking ticket if you park across the street in the lot. Harold and I took a gander around the store and then decided coffee was highly in order. We got in line behind 7 or so people in the back cafe area and proceeded to wait for nearly 30 min to even order our coffee! There was a collection about 5 employees behind the counter arranging bagels and chatting while one astoundingly slow woman took orders. Finally with some caffeine in hand and running low on leisure time we went to select some bread from again, not the most friendly woman. Overall, the experience with the haughty clientele and the bizarre employees was less than great the second time around as well. I did manage to find some excellent fage Greek yogurt and some fancy mineral water that didn't break the bank. Let's see how the bread compared. . .
We ate a pretty tasty brioche on the way home because we were very hungry. Upon our arrival at my place we started with the semolina loaf. In the above picture (beginning at the top left and turning clockwise) we have the semolina loaf, a half eaten mini-baguette (ok, so we started on that in the car too), our 1/4 of the peasant sour, an olive ciabatta pillow, and the ciderhouse dark rye. The semolina didn't seem to have much semolina in it. It was basically a fancy white bread which tasted a bit like a gas oven when you breathed out of your nose as you ate. That sounds pretty awful, but I would say it was a generally inoffensive bread without much going for it. However it did have a decent crust with a soft crumb which had a very nice hole structure. Above you can see the interiors of (l-r) the baguette, the semolina loaf, and the olive ciabatta. The baguette was much better than the one I had on my solo trip. Though, it still wasn't spectacular. It was a little flavourless and was too airy. It had a very soft and squishy crumb and a hard yet thin and flaky crust. This baguette was a little too delicate too take seriously. We then moved to the peasant sour. This was a gorgeous bread. You can see the browned/charred, floured crust in the first picture. Just beautiful. It had a soft and very moist crumb that was dense and springy. I am fairly certain they use a real sourdough starter (thank god), though it had a mild aroma. We used some butter on our last pieces and it did great things for the flavour. This was a good bread in a style I had not seen before. (l-r) the semolina loaf and the olive ciabatta again, the peasant sour, and the ciderhouse dark rye. The ciderhouse dark rye was billed as a rye bread made with hard cider. An interesting idea, though the cider flavors were not that pronounced they certainly did add something to the flavor. 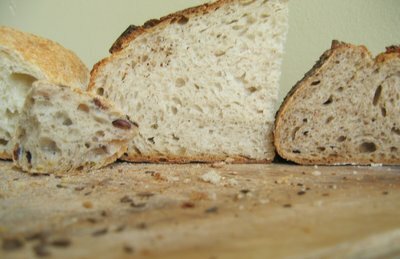 The exterior of this bread was seeded with caraway. It had a good crust and a moist, soft crumb. The crumb was a very pretty mousy grey-brown and the taste was slightly sweet. This bread went great with cheddar. This was also a wonderful and unique bread. Lastly, we tried the olive ciabatta pillow. 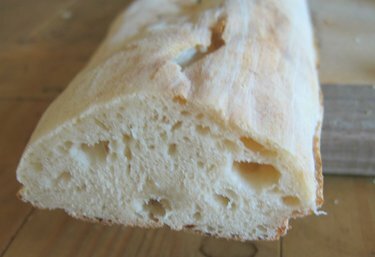 This ciabatta had nice holes (much nicer than some of the other bakeries we have been too), a traditional crusty-crust with a glossy crumb. 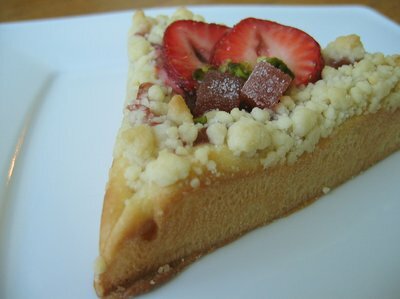 The crumb had a lovely cool, creamy texture. Oddly, the first bite of the crust I took tasted like slightly burnt popcorn. . In any event, the ciabatta was filled with many kinds of superb whole olives, much more delicious than the typical one type-diced. I thought this was delicious and it went great with chevre. Overall, I still can't really stand Fox & Obel, but their breads have improved greatly in my mind. Stay away from the baguettes and the semolina loaf and go instead for the unique, rustic, darker breads like the peasant sour and the ciderhouse dark rye. The olive ciabatta pillow would be a tasty and quick lunch if you are in the area (and probably much cheaper than actually using their lunch counter). Last Sunday the temperature in Chicago reached above 70F. It was glorious. Harold and I drove up to Devon with the windows down and then walked our way to Argo Georgian Bakery (2812 W. Devon Ave. Chicago, IL 60659. 773/764-6322). 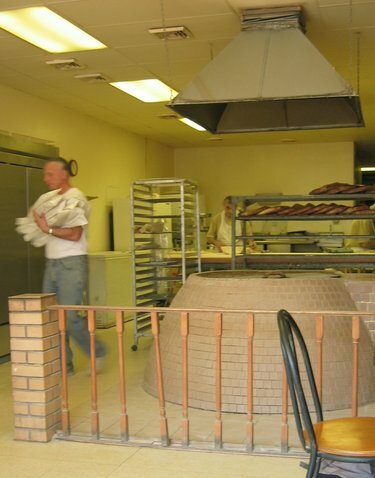 Upon entering the quaint storefront, the most unique and obvious feature of Argo is the brick, domed oven in the center of the store. According to a website called Savoring Chicago, the kind of oven is called a 'tune' oven (*Update* the oven is in fact called a 'tone'). Further, the site claims that is the only Georgian bakery in the country. Another Googling seems to support this (though there is one in Canada). As you will read, I believe we Chicagoans are quite blessed in this case. The staff and owner are very sweet and friendly and they even opened up the lid to the domed oven to show us the interior when we walked to the railing to gaze at it. Harold and I purchased three items to eat in house, plus two loaves of bread, and a seltzer water. We sat at one of the few, small tables and began with a spinach pie. This was a savory pastry with a soft, not particularly flaky crust and filled with chopped and cooked spinach. The spinach tasted as if it could well be fresh and my only complaint was that the overall effect was bland. With some seasonings, even as simple as some salt and pepper added to the spinach (or perhaps more decadently, some type of cheese such as feta), the taste might have been improved. All the same however, this was a very worthwhile purchase. Next we tried a tapluna, which is a honey and walnut pie. It consists of a long triangle of flaky pastry dough, rolled from the base of the triangle to the tip, dusted with powdered sugar, and filled with the honey and nut paste. This was also quite delicious, though perhaps a bit too sweet for my tastes. Lastly, we dug into a hachapuri (see picture below), which to our delight we realized was still quite warm. And might I say, this alone is worth the trip to Argo regardless of where you, lovely reader, might live. 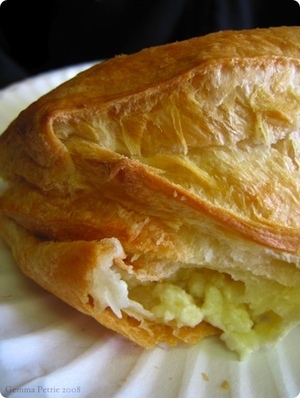 The hachapuri was a square shaped puff of flaky, golden pastry filled with the most divine mixture of mozzarella, feta, and farm cheese which, thanks to the still warm pastry, was warm, creamy, and oozing out of the pastry as we ate. At this point, to our horror, Harold and I realized that in our overzealous consumption of these delicious things I had completely forgotten to take pictures before digging in, which must be a mark of how good everything looked. (See how well-disciplined Harold and I are for you most of the time? Sometimes it is pure torture to take a decent picture before ripping into some fabulous looking loaf or pastry). At about the same time, with no real consultation, Harold and I decided we MUST have another hachapuri. This batch had come right out of the oven, and as I already admitted on my post at Chicago Foodies, I burnt my face on the hot steam escaping from the puff's interior as I bit into it perhaps a bit too hungrily. The warmer the better folks, but do be careful. I was lucky to escape without a red mark on my nose and cheek from the burning steam. The second hachapuri was gone in seconds and as we came back to our surroundings we noticed how quickly the hachapuri was disappearing as it emerged from the oven every 10 minutes or so. People were being asked to either wait our come back. This said, let me clear that you simply must try a hachapuri if you visit Argo and it would be quite wise to leave an extra 20-30 minutes just in case you need to wait. Harold and I then returned to my apartment to try the two breads. 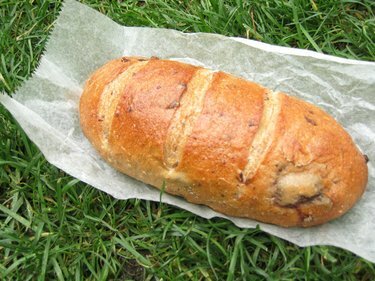 The first was a long bread called a shoti (pictured above). You probably aren't going to believe this, but the first taste this bread gives off is exactly like honey-dew melon. This is not a bad thing, but just an odd one. 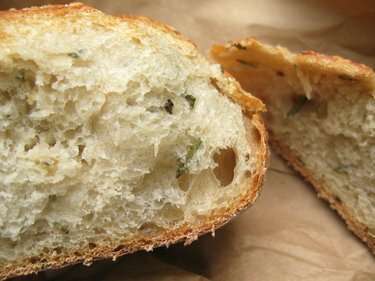 This taste disappears into more traditional bread flavors almost immediately, and you might not even notice it. This is a soft, creamy, and chewy bread. 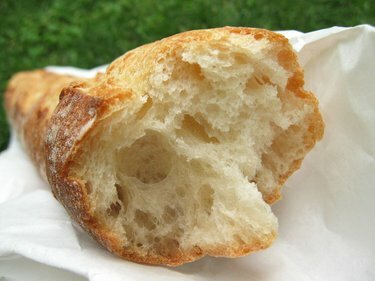 It has a dry crust, a slightly salty taste (though a bit less so than the second bread below) and a dense, glossy crumb. The second bread was shaped in a large circle and is called a puri. This was a very chewy, quite dense bread, with many tiny holes. It had a dry crust and a glossy crumb which was creamy in texture to the mouth. It had a pleasant slightly salty taste and I believe it would be fantastic with a dill Havarti. Both of these breads were superb and very unique. I have never had anything quite like them and I highly recommend giving them a try. Argo Georgian Bakery was quite impressive and I will definitely be back. Harold commented and I agree that this was the best bakery we have visited since Red Hen. One of the best. we began with a spinach pie which was fairly good, but a touch low on salt. still, the way it was seasoned gave it an odd (almost iranian tasting?) flavor that helped to balance out the lack of salt. overall it was unusual and worth trying, especially if you like spinach. we quickly (as in withing seconds) moved on to something called a tapluna, which was a honey and walnut pastry. this was quite nice and the sweetness was surprisingly moderate for something that featured honey so prominently. that said, i don't really go for sweet stuff. microseconds later, we were inhaling a hachapuri that was still warm. this was a puffy, flaky, crumbly, steamy pastry filled with a judicious blend and quantity of cheeses (namely mozzarella, farmer's cheese, and feta), a fair description of which defies words--polite ones anyway. better still, near as i can tell they make these constantly, so one is quite likely to enjoy a hachapuri that is still warm. gemma and i went back up to the counter for another. we were rewarded moments later when another tray came out of the oven and i held in my hands a paper plate containing a hachapuri that had been baking not ninety seconds before. gemma and i both burned our mouthes on our respective first bites of this second hotter hachapuri, but undeterred continued to burn our mouthes until all that remained was a pile of crumbs and two smiles. seriously people, these are good. eventually we made it back to gemma's place, where we investigated some more normal (read: less stuffed) breads. first came the puri, or georgian round bread. this was quite good, quite round, and fairly flat. it looked a bit like mutant over-grown indian naan, actually. looks can be deceiving, however: the taste reminded me more of a crusty italian bread, but with more salt. this bread is great alone or with butter, but would probably also tolerate a fairly mild cheese. 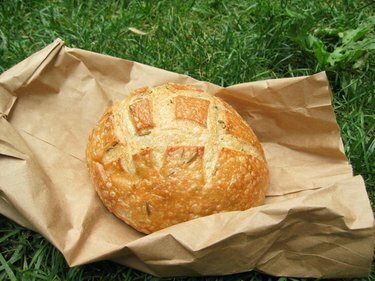 while it would not lessen your enjoyment of a stronger cheese, a stronger cheese would probably lessen your enjoyment of this bread (a bit), as it is rather mild in flavor. 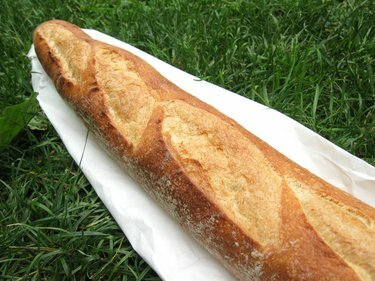 we moved on to something called a shoti--or long bread--which was shaped much like baguette. this was creamier and denser in texture, as well as slightly moister inside. this was about what was going through my head when gemma asked, "do you think this tastes like honeydew?" i looked at her like she had three ears and antennae. "seriously," she said, "i think this tastes a little like honeydew..." i looked at her as though she was snacking on kleenex. "just try it." i did. nothing. "well?" i took another bite. and then something truly strange happened: i tasted honeydew. now we both know that it is impossible for bread to taste like honeydew, so what did i learn from this? 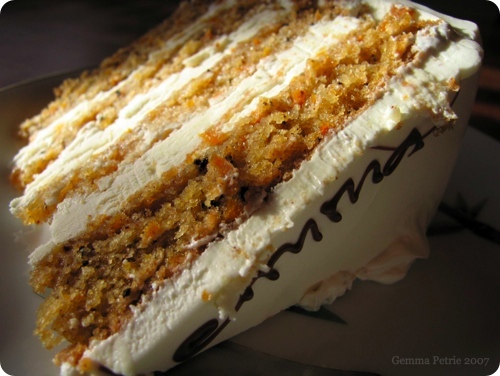 don't trust gemma: she'll mess with your mind and make you taste things that aren't there. her powers of mind control are terrifying. 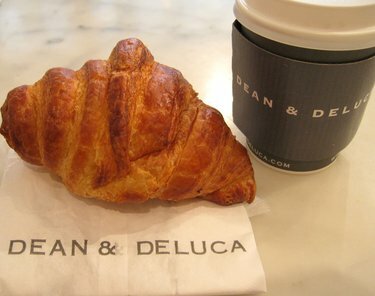 despite all my rambling on, there is a one-word verdict about this bakery: GO. 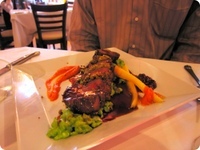 Josh of Chicago Foodies has invited me to contribute Chicago bakery reviews and the occasional Hyde Park restaurant review to his fantastic site. You can currently read about my recent trip to Argo Georgian Bakery as well as a wide variety of posts by other authors about the Chicago food scene. I'm flattered to become part of such a great Chicago resource. breadsmith is located squarely in the lincoln park yuppie-zone, at 1710 n. wells. while i am normally loathe to countenance any bakery selling gourmet dog biscuits i meticulously prepared myself to make an exception in this case. sadly my charity was misplaced. the premises were clean and appeared to be well maintained, but standing there i found myself strangely unable to muster any interest whatsoever in the coffee. i have no idea what came over me, actually. while the bakery seemed to be "service oriented," i could not help but notice that the short-term memory of the gentleman helping us was sub-human. also of general interest: breadsmith is hardly a back-to-basics type bakery. a brief look at their website confirms this. we began with a roll that was mild--almost tasty?--in flavor and had a fairly nice crust. it would have done well with more salt but was otherwise ok. unfortunately it reminded me of spongecake. queer, no? we continued with something called a simit. it had a slightly sweet and insubstantial crust. it is slightly tragic that i will never get back the three minutes of my life that i spent tasting this bread. subsequently we tried the salt stick. the salt stick had an impressively chewy crust with caraway seeds and the overall flavor was (wait for it....wait for it....) salty. while the caraway was certainly a nice touch, it was rather overdone. be that as it may, this bread was without doubt "best in show." the ill-conceived focaccia roll seemed like something straight out of alice in wonderland, if only inasmuch as i could think nothing but "curiouser and curiouser..." as i ate it. chief among the myriad sins committed in the design and execution of this "bread" were that it was structurally unsound and far too salty. the final item we tried was the cheddar-jalapeño bread. in its present form, it is too cheesy and a tad short on the jalapeños and really ought to be reinvented as a roll that is never served any other way but pipping-hot. other possible improvements include the use of better (white?) cheddar and fresh jalapeños in lieu of the pickled ones that are presently employed. 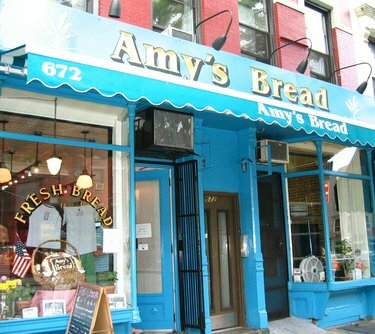 unfortunately the best thing i can say about it is that it is not just like every other yuppie-zone bakery. usually the preceding remark would be a compliment, but in this case i fear it is not: any amount of conformity to the gourmet bread status quo be of great service to this bakery.